I first saw the idea of this baby discovery jug on Pinterest and decided it would be a great baby toy for our 1 year old, Amelia. 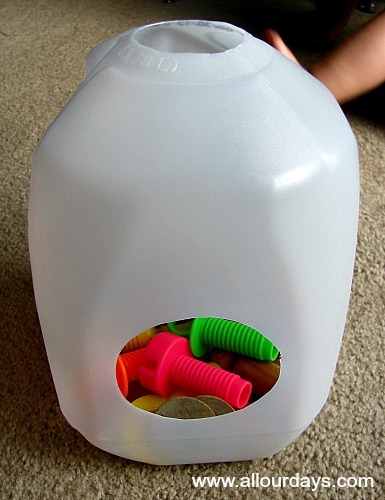 The concept is very simple, just an upcycled bottle or jug that baby can drop small objects into and then grab them out again. I used a gallon milk jug, although a half gallon jug would work well, too. I simply cut off the top. This makes the hole a bit larger, but also keeps baby from trying to chew on the plastic, eww! Then I used the circle indentation on the side as a guide for a larger hole. That’s it! See how simple it is to make your own educational baby toy! 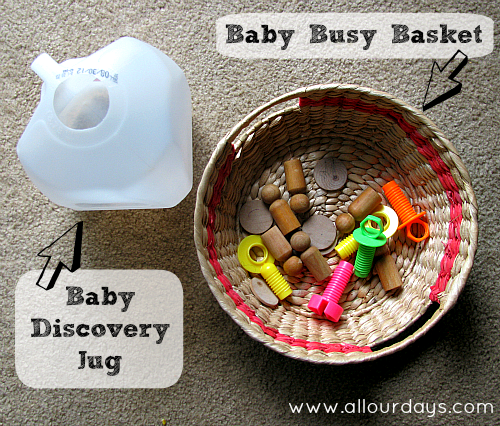 When I introduced the Discovery Jug to Amelia, I placed a variety of small objects into her Baby Busy Basket and sat her on the floor next to the basket and the jug. The older kids showed her how to pick one object from the basket and drop it in the hole at the top of the jug. She did this a couple times (with the older kids applauding each time). After there were a few object in the jug, we showed her how to reach inside the larger hole and pull the object back out. Amelia love this discovery jug. She loves dropping the objects in and grabbing them back out. 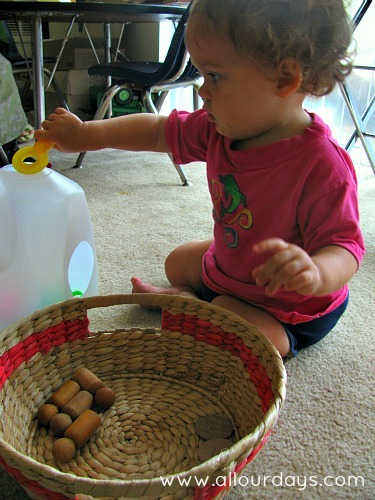 She also loves shaking the jug, which makes different noises depending on what objects are inside. Amelia also likes turning the jug on it’s side and dumping the objects back out. What are some simple activities or toys that your baby loves? Fantastic!! Thanks for the article. 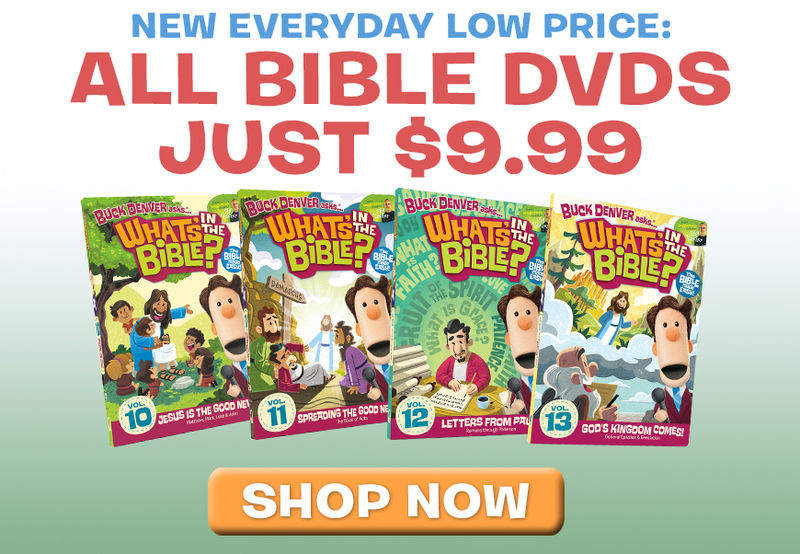 Doing this from some of her school in a box items tomorrow for certain! 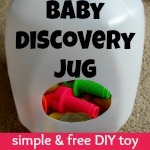 http:// Re: Baby discovery Jug. The items in that baby discovery basket looks small enough for the child to choke on them.! At the age of one, our daughter rarely put items in her mouth and always played where I could see her at all times. Also, the items were not small enough for her to swallow, although I’m sure she could have gagged on them if she was trying really hard to. Does the milk jug have sharpe edges?